Zombies take over the School of Chemistry! 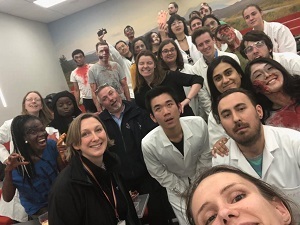 The public engagement event Operation Isolate, a science-themed Halloween horror maze in collaboration with the local charity Health in Mind, ran for its 2nd year on 27th October 2018. Set at the historic Joseph Black Building, the School of Chemistry was the setting for a zombie outbreak that had claimed the lives of many staff and students. Courageous members of the public were invited to investigate the mysterious circumstances preceding. Attendees experienced a mix of running through zombie infested corridors, and taking part in experiments to figure out who and what was responsible, covering such principles as spectroscopy, fluorescence, and molecular probes. Upon discovery that the cause was an opportunistic infection that prays on stressed people (including themselves), attendees would then learn of positive mental health techniques to get them out of the maze and hopefully through the night. In escaping the attendees left with knowledge of some of the exciting research taking place at the university, and advice on services available to them for promoting good mental wellbeing. This event saw over 40 undergraduate, postgraduate, and staff volunteers from the College of Science & Engineering transform and put together a truly memorable experience. In addition, it raised £323 for Health in Mind and helped create a lasting partnership that will make their services more accessible to university staff and students.